The Canada Revenue Agency netted more than $1 billion over the past five years through the agency's annual reviews of Canadians' federal benefits — prompting critics to accuse the agency of making money off the most vulnerable. Critics also say that some of the benefit money clawed back from taxpayers is actually coming from people who qualify for those benefits but couldn't prove it because of the agency's onerous standards, tight timelines and bureaucratic bungling. "The part that's troubling is what we hear from Canadians (who) ... do qualify for the benefit but simply can't comply with the demands put on them to prove their claim with the CRA," said Conservative national revenue critic Pat Kelly in an interview with CBC News. "If people are just simply giving up on benefits to which they're entitled, that's not the way that a government should raise revenue." CRA numbers provided to CBC News show that since 2013-2014, CRA benefit reviews have identified $3.021 billion to be repaid by taxpayers — while the amount the agency found it owed taxpayers through those reviews totalled $1.837 billion. The result: the CRA netted $1.184 billion through benefit reviews over five years. "It's a big number and it would represent many thousands of families that would be affected, so this reaches into every community across Canada," said Kelly. 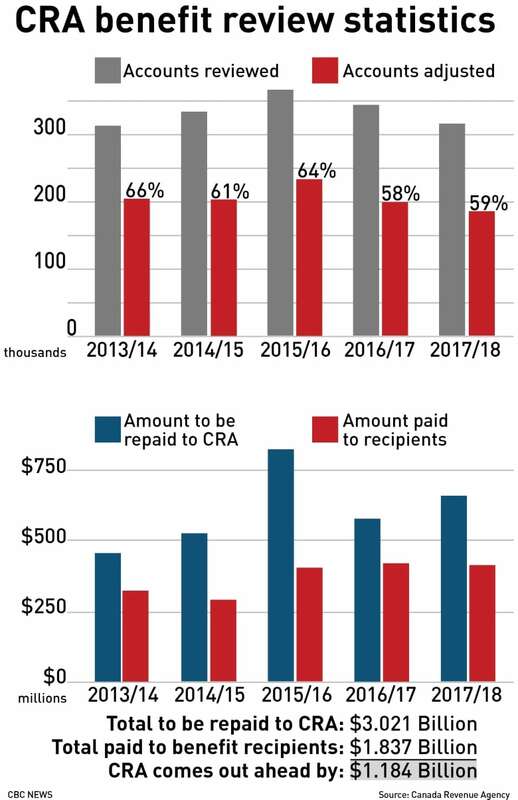 The smallest yearly gap between the amount payable to the CRA through benefit reviews and the amount the agency owed was recorded in 2013-2014: $128 million. The widest gap was recorded in 2015-2016: $415 million. Gerry Campbell is a tax specialist with Liberty Tax Services in Toronto. He said that while there's no doubt CRA reviews catch people who should not be receiving benefits, or are getting too much, he's also sure that some of the money the agency claws back is coming from Canadians who are eligible for their benefits. "The eligible benefit deduction and the subsequent child tax benefits is probably the government's most cost effective clawback they have," said Campbell. "The CRA is a collection agency. For them, it's an easy target." Each year, the CRA reviews the eligibility of hundreds of thousands of Canadians for the Canada Child Benefit (and its predecessor, the Universal Child Care Benefit) and the GST/HST credit. Eligibility for those benefits can change due to shifts in income, marital status and custody status, among other things. Over the past five years, the agency has reviewed 332,131 accounts each year on average. About 62 per cent of those accounts are found to be in need of adjustment one way or the other. "At its core, the objective of the benefits validation program is to ensure that the right recipients receive the right amount of benefits — no more and no less," said agency officials in an email to CBC News. "The program does not have any revenue targets." The CRA's benefit reviews have come under increased scrutiny in the past year as Canadians have come forward with complaints about the agency's onerous requests for proof of eligibility. Some have claimed that, even when taxpayers are able to comply with the 30 day time limit, the CRA does not believe them. Others have come forward accusing the agency of losing their submitted documentation or giving them inconsistent information over the phone. "In so many of these cases, these benefits are being denied unjustly. Revenue Canada is actually pushing for repayment from folks who should be receiving the benefit," said NDP finance critic Peter Julian. "Through these reviews there's a crackdown on families. And families often don't have the resources to push back." Last spring, the agency commissioned its own focus group study of Canadians who had seen their benefits cut off and subsequently restored. The study found many people experienced problems with the benefits validation process — failing to receive an initial review letter requesting documentation, not being given enough time to gather the necessary proof, finding that the documentation demanded by CRA was too difficult to pull together. Gathering the required proof can involve going to school officials or medical professionals, navigating the legal system or reaching out to an estranged spouse for help. Many Canadians told the focus group they're still frustrated by their inability to get anyone from CRA on the phone, which makes it difficult to ask for time extensions. "The CRA asks to provide your information within 30 days and if you can't meet that, you can get cut off," said Campbell, adding that if someone objects and submits documents for further review, there's no reciprocal commitment from CRA to deal with that submission within a certain period of time. Benefit reductions and clawbacks can be reversed, he said, but it can take months or longer to sort it all out. "And they've been living on that child tax benefit. It can be part of the rent they pay every month." The CRA's own focus study recommended that the agency officially lengthen its initial time allotment for Canadians to comply with a review. The CRA hasn't followed through on that recommendation so far. The agency says instead that, if recipients have not responded to a request for information, instead of adjusting their benefits immediately the agency will contact taxpayers first, and offer them access to the agent working their case if they need more time. National Revenue Minister Diane Lebouthillier declined to do an interview with CBC News. She said in an emailed statement that, since coming to power, the Liberal government has invested in a new client-focused approach at CRA that has resulted in service improvements. 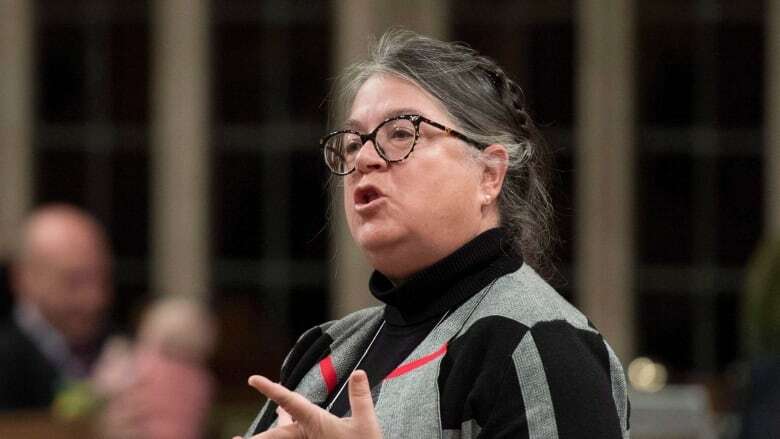 "As a former social worker, I recognize that the credits and benefits offered to the most vulnerable Canadians are essential for them to make ends meet," she said. "That is why, in the spirit of better service, it is important to me that Canadians receive the amounts to which they are entitled." The minister has admitted that more work needs to be done. 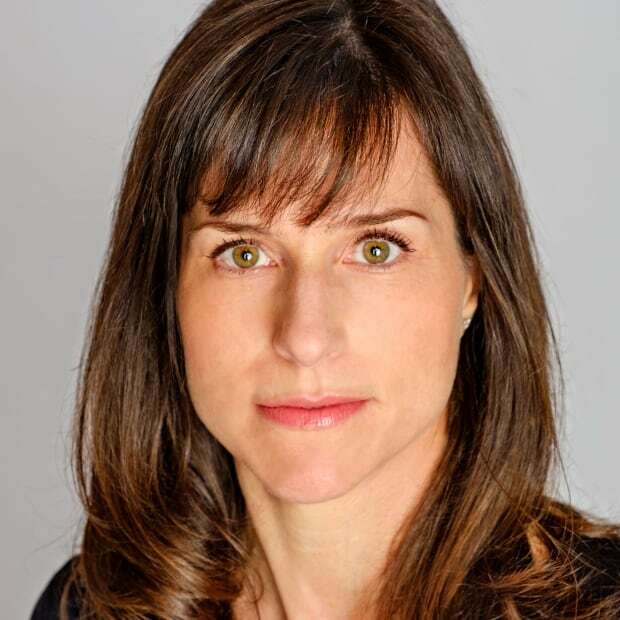 She announced Monday the appointment of the agency's assistant commissioner as its first Chief Service Officer, who will launch consultations with Canadians on how to improve the CRA's service. Julian, meanwhile, said the problems created by the benefit reviews seem to be getting worse. "What I'm finding in my riding is more and more people who do qualify for the benefits are seeing them taken away, often by administrative fiat," he said. "And most of the time, the CRA is wrong. But because these families don't have the resources, they don't know to whom to turn." The NDP has long argued that under the previous Conservative government, and now under the Liberals, the CRA has targeted average Canadians while shying away from going after the big tax cheats who have the resources to fight the agency. The numbers the CRA provided on benefit reviews do not include a tally of future benefit payments that would have been paid out to Canadians if a review had not reduced or eliminated them. In other words, the numbers do not include money the government is saving going forward by not paying the benefits.